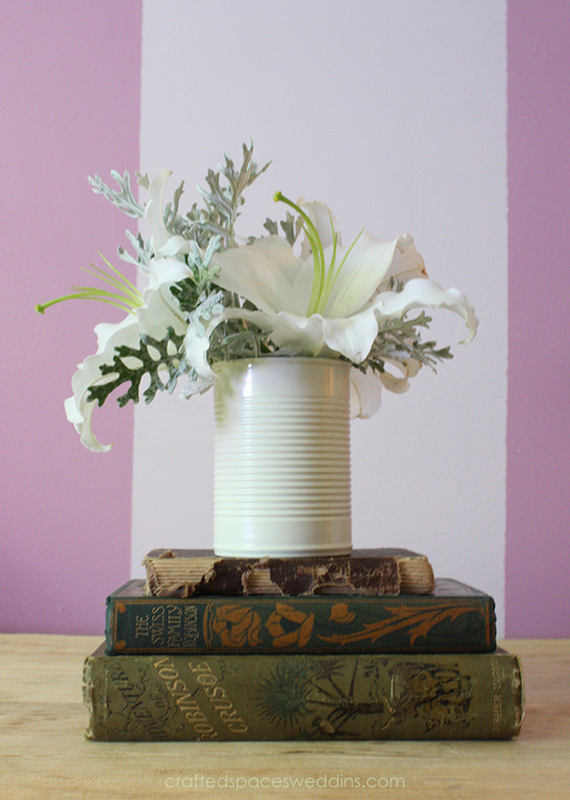 A recycled tin can is a great choice for a rustic centrepiece. 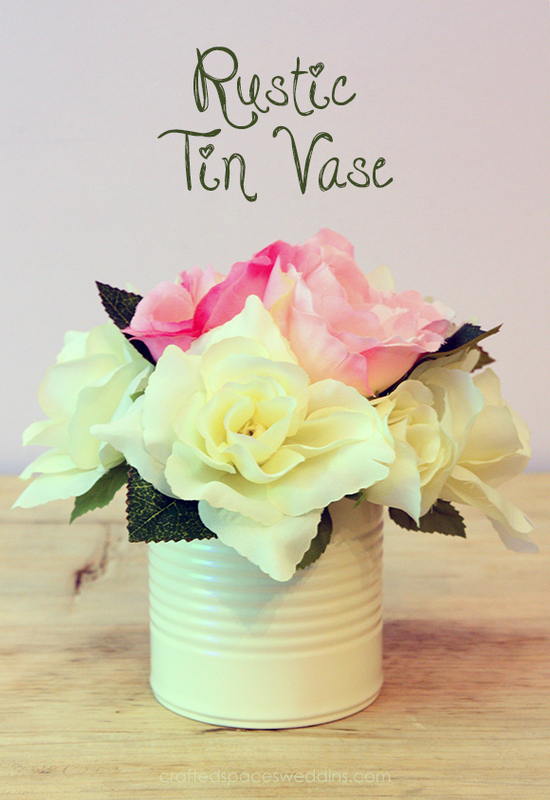 You can make a variety of tin vases using different size cans. You can ask friends and family members to help collect cans for you. Select a colour that coordinates with your wedding. When it comes to spay painting, I suggest that you work outside or in a well-ventilated area. 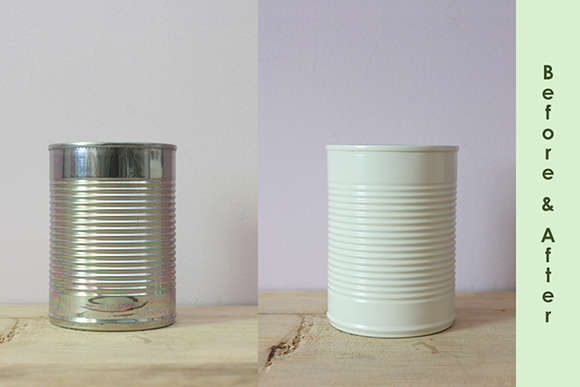 You can prime your can and let it dry overnight. For this project, I used Krylon indoor/outdoor, ivory gloss spray paint. 1. Smooth any jagged edges with a metal file. 2. Clean your can and dry the surface. 2. Spray paint the can in a sweeping motion from side to side and slightly overlapping. 3. Apply several thin coats and let dry between coats. 4. If needed, lightly sand the surface to remove any unwanted beads of paint or other imperfections. You can also use the sandpaper to create a worn/shabby look. 5. Let dry overnight, then make your arrangements. You can place a glass of water inside your tin vase and arrange fresh flowers or you make an arrangement with floral foam and silk flowers. Yvette-Michelle is a bridal consultant and wedding coordinator in Greater Toronto, Barrie, and surrounding areas. With over twenty years of experience, crafty know-how, and a flare for style, she provides her clients with expert advice and the help they need to transform their creative wedding dreams into reality. Crafted Spaces Weddings is an exciting extension of Crafted Spaces. Our planning, coordinating and creative design services will help you create the unique wedding you want. We also offer DIY Wedding workshops, where you can create beautiful handcrafted elements for your wedding. Crafting creative and elegant occasions. Visit Crafted Spaces Weddings's profile on Pinterest. Copyright © 2013 - 2019 Crafted Spaces. All Rights Reserved. Simple theme. Powered by Blogger.